Four ICA Commissions (Cartography and Children, Education and Training, Maps and the Internet and Planetary Cartography) and the Working Group on Cartography for Early Warning and Crisis Management will participate in this Joint Symposium, which is organized by the colleagues of the Laboratory CEDETE (Centre d'Etudes pour le developpement des territoires et l'environnement) at the University of Orleans, within the programme of activities previous to ICC 2011. Organizers will welcome individual paper and poster submissions to be presented on any of the joint thematic sessions corresponding to all the topics from the fields covered by the participant Commissions and Working Group. A very important condition to fill is that the organizers will accept only papers that won't be presented in the 25th International Cartographic Conference in Paris. From last September we were having periodical contacts with the French colleagues to ultimate details related to the organization of the event. Very shortly we will send the Call for Papers for all the Commission members and interested colleagues from other institutions and associations, containing detailed information about deadlines, registration fees and others. The website of the event will also can be accessed from January. From last September the Commission website has been updated with the new materials related to the Barbara Petchenik Competition and Exhibition in 2011. All the colleagues are invited to visit the website. If you have any kind of question related to the organization of the competition, please contact Commission Co-Chairs. An event organized by the ICA Working Group on Cartography for Early Warning and Crisis Management together with the Open Geospatial Consortium (OGC) Domain Working Group (DWG) on Emergency and Disaster Management (EDM), within the activities related to the AUTOCARTO 2010 conference in Orlando, Florida. The symposium was held last November 18 and 19, and our Commission was represented by Temenoujka Bandrova (Bulgaria), who presented the results of her research on the topic "Cartographic Application on the base of Children's under-standing of Early Warning and Disaster Management". This year GIS Day was celebrated on November 17. 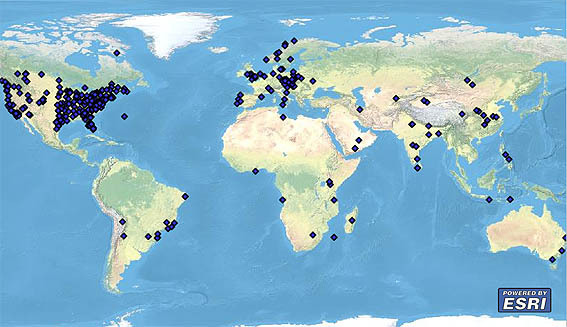 The world map below presents the geographical distribution of the institutions that organized any kind of activities related to GIS for children and young people. Visiting the www.gisday.com website you can find more detailed information about the events organized this day, together with free materials that can be used not only in GIS Days, but also in other events organized for schools in our countries. GIS Day 2011 will be held on Wednesday, November 16, 2011.
iGuess course hosted by EUROGEO now validated by the EC for grant funding. Grants available for participation, travel and accommodation expenses. The course takes place alongside the EUROGEO conference in Athens. Deadline for grant application to your Comenius national agency is January 14th. Visit http://www.eurogeography.eu/iguess.htm to find out more. Registration for ICC 2010 is open from last November. The early registration fee (500 € for participants) is valid to March 1, 2011. - 6th International Workshop on Digital Approaches to Cartographic Heritage. The British Sub-Committee of the IGU CGE is organising a Commission on Geographical Education Symposium on Curriculum Making in Geography in the heart of London, UK. Venue: Institute Of Education, University of London, London, United Kingdom. Theme: "Curriculum Making in Geography"
January 7th, 2011: Deadline for the submission of papers for Symposium Programme and Proceedings Book. January 7th, 2011: Deadline to pay Early Bird Registration fee. Venue: University of Salzburg, Austria. GIForum is an international conference for those that share an interest in GIScience and Technology. Themes & Application Fields: Advanced visualisation and cartography, geospatial data acquisition, advanced spatial analysis and knowledge extraction, distributed and mobile services, SDI, dynamic modelling and simulation and others. Special sessions and workshops: Learning with Geoinformation, Climate Change and Spatial Vulnerability Assessment, Global and Climate Change: Monitoring and Modelling. Venue: Escuela Militar "Bernardo O'Higgings", Santiago de Chile.